When looking at the exhibitions organized under Quirk's era at Lehigh, we are seeing a stream of talented artists who are now represented in regional and National Museums. Perhaps the renaissance of his reputation as a painter will be matched by a newfound respect for his curatorial efforts. This post focuses on Charles Ward. As you will read below Quirk included him in a 1960 exhbition with Waldo Peirce and Raymond Galucci A full Ward biography can be found on AskARt. We have excerpted from it below. An artist of national repute, Charles William Ward of Carversville, Pennsylvania, was widely admired for his achievements in many media, particularly in the field of mural painting. He also did landscapes and portraits, and the aggregate of his work in all fields was large. His genius was recognized in many one-man shows in cities across the country, and representations in the permanent collections of important museums. Mr.Ward was equally appreciated by his friends and neighbors for his great personal warmth and kindness. 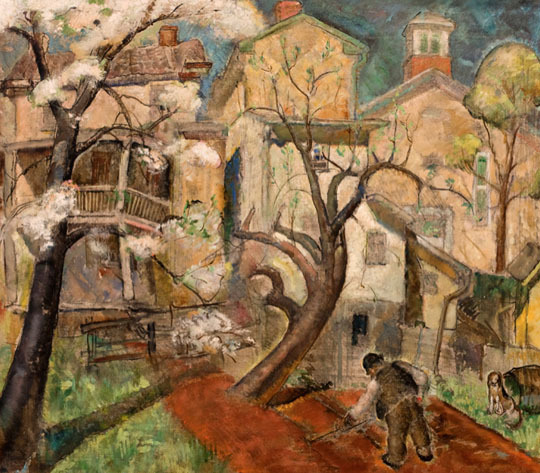 From 1926 until 1931, Mr. Ward was a student at the Pennsylvania Academy of Fine Arts in Philadelphia, at which he studied painting and sculpture. There he won the Thompson Prize for Composition; the Lea Award for Draughtsmanship; and, in 1930, the Cresson European Traveling Scholarship, which enabled him to go abroad and study in Great Britain, Belgium, France, Spain, Italy and Switzerland. 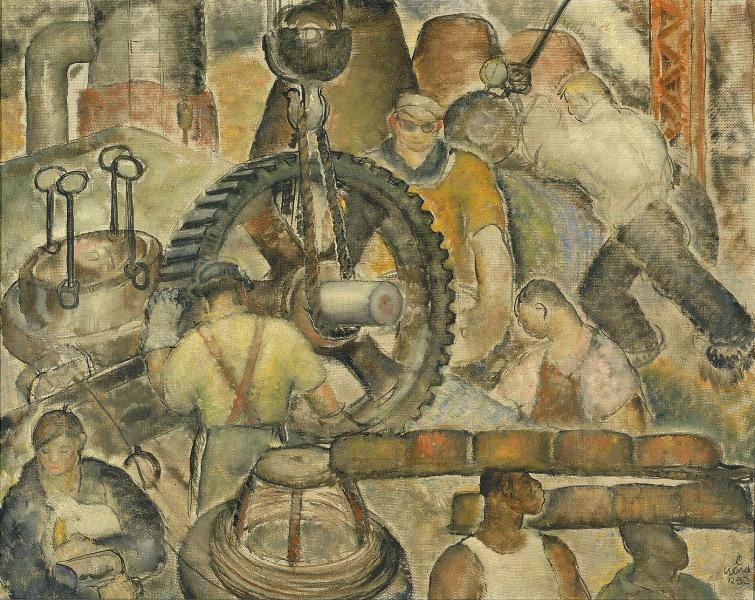 His mural work began in 1935, when he executed his "Progress of Industry" mural in the Trenton, New Jersey, Post Office, as the nation's first Post Office mural under the Public Works of Art Project. In 1937 he completed two others in the same building, entitled "Rural Delivery", and "The Second Battle of Trenton". 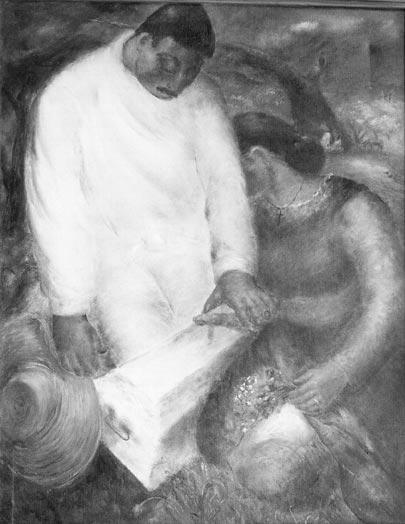 Later large works were "Cotton Picking", in the Roanoke Rapids, North Carolina, Post Office, and two murals (now lost) which adorn the walls of the Bucks County Playhouse Inn, at New Hope, Pennsylvania. 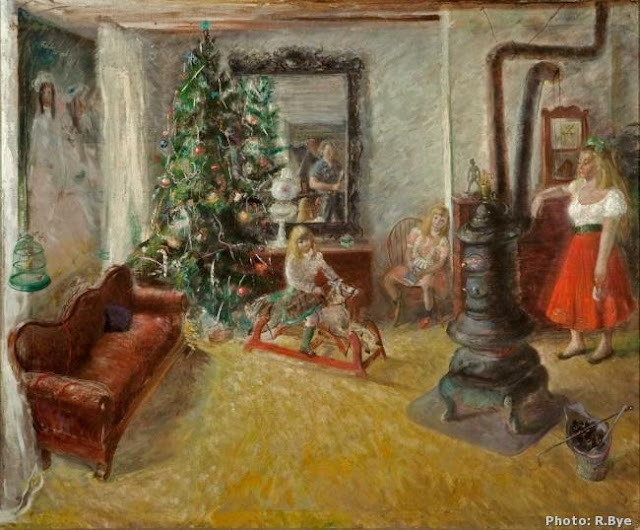 In looking through his work, this melancholy painting of a Christmas scene is surprisingly appealing with it s holiday tree and the painter reflected in a mirror. There are signs of wealth,but yet the mother on the right seems tired and distant; as if she were in an Edward Hopper painting. Interestingly his bio includes a quote from Professor Quirk. "Charles Ward, rearing back, godlike in his secure opinions, hurls his social commentaries like justified thunderbolts. 'Why? ', 'Sorrow' and 'Millwrights' are dissertations as clearly as the works of Goya, Daumier and Rivera. 'Nor may it be implied that their artistic merit suffers for their messages. Craftsmanship and content were well grasped before he received the Cresson traveling scholarship. (His) contemporary-type canvases originate as the expression of a profound humanist, involved with his time and fellow man. They embrace international themes rather than local problems, becoming a part of evolving socio-political concepts." We have obtained images of two of the paintings below form the Charles Ward Website. 'In the area of portraiture, Mr. Ward excels in the handling of representation of many-sided characters. His heads are uncomplexed by fad or style of interpretation. They are clear and clean; opinionated, to be sure, but none the less direct and reflective of the integrity which distinguishes the intelligent, well-trained artist that Mr.Ward is." We also include below two other images that represent his work. The first is Industry from the Smithsonian Art Museum.